Lenders, issuers, and health care providers turn to Chapman’s extensive experience in health care finance. Chapman has been involved in the development of a number of the products used in the capital markets today and our attorneys are noted thought leaders in both the not-for-profit and for-profit health care financing sectors. We have handled transactions from a wide variety of perspectives, serving as bank counsel, bond counsel, borrower’s counsel, underwriter’s counsel, special tax counsel, derivatives counsel, and regulatory counsel. Clients. 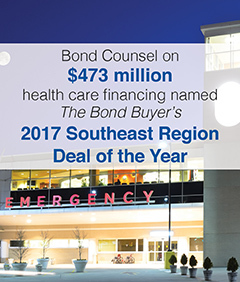 Our clients include bank and nonbank lenders and credit providers, issuers, underwriters, multi-state and multi-hospital systems, stand-alone hospitals, senior living facilities, social service agencies, academic medical centers, and other health care providers. Practice Depth. Chapman health care deal teams possess a thorough understanding of our clients’ needs and legal challenges, allowing us to provide both practical and strategic advice for a vast array of issues that may arise. Commitment to Value. Our commitment to value extends beyond closing a deal or resolving a matter—we share our insights to help clients advance their goals. A health care management services organization provides non‑clinical, administrative support services to physician group practices and other health care providers. One of the primary purposes of a MSO is to relieve licensed health care providers of non-medical business functions so they can focus on the clinical aspects of their medical practices. With AHCA Withdrawn, What’s Next for Health Care Reform? On March 13, the Congressional Budget Office released its highly anticipated score of the American Health Care Act, the Republican-proposed replacement bill for the Affordable Care Act.